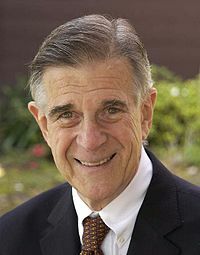 Congressman Pete Stark of California gave a statement on the House floor April 27 officially recognizing the National Day of Reason held today, Thursday, May 3, 2012. Rep. Stark said, in part, “Mr. Speaker, I rise today to recognize Thursday, May 3, 2012 as the 2012 National Day of Reason. The National Day of Reason celebrates the application of reason and the positive impact it has had on humanity. It is also an opportunity to reaffirm the Constitutional separation of religion and government.” Stark pointed out that our nation is home to a wide range of people of different backgrounds and beliefs, and “the only way we can solve our problems is through cultivating intelligent, moral and ethical interactions among all people.” Rep. Stark said the National Day of Reason is about helping others and improving communities, and mentioned efforts by secular people across the U.S. to conduct food drives, donate blood and help those in need on this day. Rep. Stark urged everyone to observe the day by focusing on the use of reason, critical thinking, the scientific method and free inquiry to improve the world and our country. May 3 is also the “National Day of Prayer,” and event that was ruled unconstitutional by a U.S. District Court in Wisconsin. On April 15, 2010, Judge Barbara Crabb issued a ruling in which she concluded the National Day of Prayer violates the establishment clause of the First Amendment, saying it “goes beyond mere ‘acknowledgement’ of religion because its sole purpose is to encourage all citizens to engage in prayer, an inherently religious exercise that serves no secular function in this context.” President Obama is holding the National Day of Prayer despite the federal court ruling against it.